14k gold custom made bridal set ring consisting of round shape, natural diamond, weighing 1.02 - 1.05 carats, having a M color and SI1 clarity, according to GIA grading scale. The center stone measuring 6.35mm x 6.41mm x 4.1mm. All surrounding diamonds are genuine with a total carat weight (cttw) of 0.24 carats. 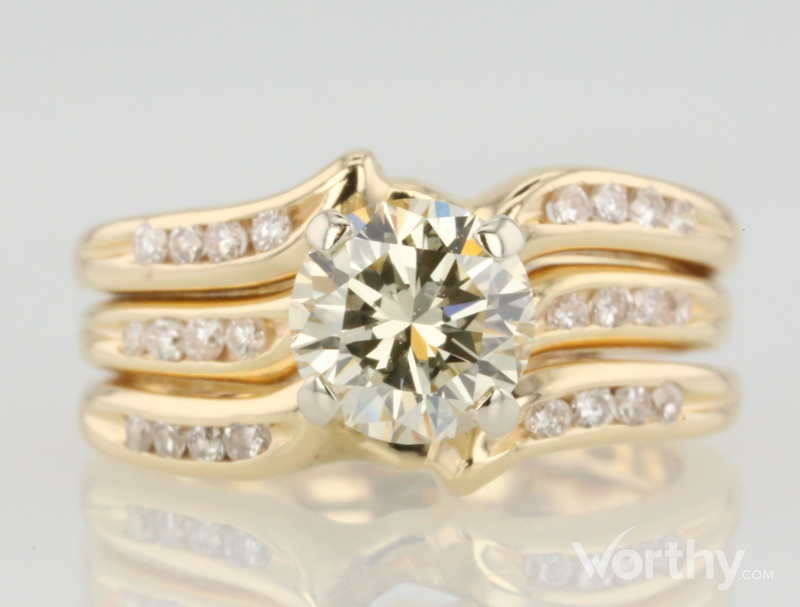 Ladies 14 kt yellow gold swirl design 3 piece wedding set that has been soldered together to make one ring. Ring measures9.omm wide across the top and tapers to 4.0mm and is channel set with a total of 24 full cut round diamonds with 12 diamonds on each side with 3 rows of 4 diamonds each on either side of the prong set center diamond.